I opened a special bottle the other night: Red Newt Cellars Cabernet Franc 2008, from Glacier Ridge Vineyards in the Finger Lakes. It was everything an Eastern U.S. cab franc should be. It had vibrant medium-deep color, cherry fruit spiced with white pepper and clove and a sweet-ripe finish that put the lie to the complaint that the Eastern part of this country can’t ripen wine grapes. As we gulped the wine all too fast, it developed an interesting note of clove and fenugreek, and while it wasn’t particularly tannic, I was aware that by drinking it now, we were depriving it of a fruitful future. Somehow that seemed appropriate. I had chosen the wine in honor of Dave and Debra Whiting, the husband-and-wife team behind Red Newt Cellars and Bistro in Hector, N.Y., on the southeast side of Seneca Lake. Since starting “the Newt” in 1999, David had become one of the Finger Lakes’ top winemakers and Debra the region’s leading chef, championing the “locavore” movement by featuring ingredients from nearby farms. She is widely credited with sparking the restaurant revolution in the Finger Lakes wine country, which had been dependent on fast food. Sadly, Dave and Debra Whiting were in a tragic car accident on June 30 on the New York State Thruway as they were returning home from visiting friends and family in Vermont. Deb, 52, was killed. Dave, 47, suffered lacerations and has reportedly been released from the hospital. A passenger in the other car involved in the accident was also hospitalized with lacerations. I met Dave and Deb Whiting a few times over the years, not enough to call them friends but certainly enough to become a fan. I cheered earlier this year when Red Newt wines became available in the Washington area. I also attended a Riesling retrospective dinner at the Bistro in May 2010 while judging a wine competition in Watkins Glen, and I had the pleasure of visiting with them both. Deb was relaxed, enjoying the dinner with her customers rather than slaving in the kitchen, a show of confidence in her staff. Talking to them, I could sense the source of their appeal: These were honest people, with nothing to hide but lots to share. But enough from me. Here are tributes from people who knew Deb Whiting much better. Evan Dawson, managing editor of NewYorkCorkReport.com, wrote: “Deb Whiting shared more in common with her hero Alice Waters than she was willing to let on. Waters pioneered a local food movement in California; Whiting practically invented the local food movement in the Finger Lakes. She was proudly working with local agriculture long before it became a national trend, long before ‘local’ became an effective marketing term. “But give Deb credit for two things: First, she didn’t think the local food movement was a fad, but instead a permanent shift in values. Second, she didn’t give a damn if she were wrong about that, because she was going to keep right on serving local food. 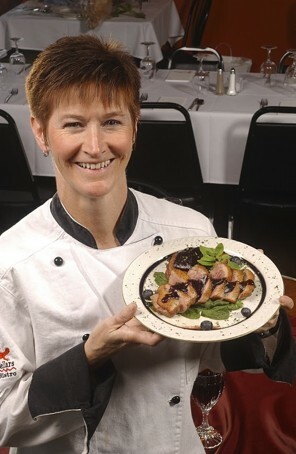 With the passing of Deb Whiting, the locavore/locapour movement has lost a champion.